I'm ready for bear.....bring it on! Ready,set ,go! Looks like you're ready! (how are those STARBUCKS coffee mochas???? Are they the ones in the little bottles in the cooler with the sodas? 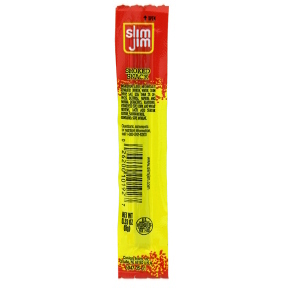 Slim Jims? Really? Bad Bad Bad! Thanks Jennifer, I've never heard of them they don't sound heart friendly! Yeah...there's fat in em 4 sure...But you know what's not in them???? That's right...they are "nicotine free."!!! PS - Congrats on 6 days! Take care of yourself, you know how to do this...so good to have you back. Congrats on 6 days. That is one heck of a quit kit. So...that stuff will last you a few days? Congrats on 6DOF! Your list made me laugh--at myself. The other day at the store, my check out consisted of 2lbs of grapes, a bag of halos (that's where the healthy stuff ended), the 'party' size bag of peanut butter m&m's, large bag of wintogreen lifesavers, 4 packs of cinnamon gum, 5 lb bag of cashews, 2 lg bags of already popped popcorn, and two 2 liter bottles of ginger ale. Way to go, Pops. Although I'm new here, I've been reading back on your blogs and have been enjoying them immensely. I'm glad you're back. That sounds awesome!!!!!!! Way to go on 6 days! You've inspired me to go look for some PB filled pretzel bites-YUM!!!! Eating is way way more fun than smoking ever was!